On 20 July 1915, George wrote to his mother to say I like you to tell me all the news about who’s dead. I remember Charley Goodchild, he used to come up to Burgh on grandfather’s allotments. Ned also responded: I have often wondered about that Charlie too, I thought perhaps he was a prisoner in Germany. Who was Charlie Goodchild? The Goodchild brothers had other relatives who fought in the war, but Charlie was close enough to the family that Etta thought she should mention his death. George and Ned had recollections of him in the company of their grandfather Henry Goodchild, but I had never heard mention of his name in the family so it seemed worth finding out more about him. Indeed it was, especially after Pauline Bryon contacted me from Australia with more information about the man who had been married to her grandmother. 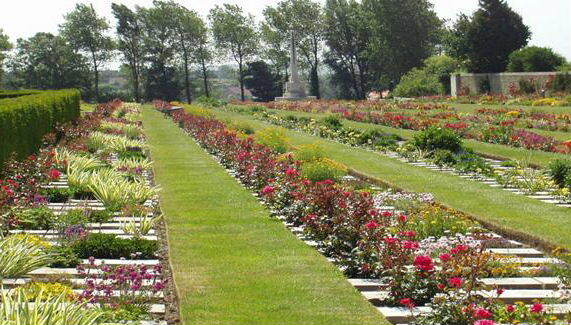 The Commonwealth War Graves Commission (CWGC) lists confirm that 6594 Pte Charles Henry Goodchild, 2nd Bn. Suffolk Regiment, died on 29 June 1915 age 28, interred at Boulogne Eastern Cemetery. “Son of Mrs Cousins, of 31 Ranleigh Road Ipswich; husband of Laura Pardey (formerly Goodchild) of 47 Ashtree Road, Bitterne Park, Southampton “Remembered With Honour “. Charlie is next sighted in 1903 when in July he enlisted in the Suffolk Regiment (12th Foot) Militia just short of his 18th birthday. He may already have had some familiarity with army life having belonged to the 1st Suffolk and Harwich Volunteers. At Attestation in 1903 he gave his trade as a fitter and his employer’s name as Ransome, which suggests that he had been working for one or other of the Ipswich engineering companies Ransomes and Rapier or Ransomes Sims and Jefferies though he was not apprenticed. Oddly, he correctly gave ‘mother’ (address: 31 Ranelagh Road) as his next-of-kin but named her as Emily Goodchild even though his aunt Emily was only seven years senior to him and of course his mother was Ellen Cousins. In the Census of 1911 he was at the Mustapha Pasha Barracks at Alexandria, Egypt, serving with the 1st Battalion Suffolk Regiment with the rank of Lance-Corporal, but a few months later he completed his eight years with 1/Suffolk and was placed on the Military Reserve. 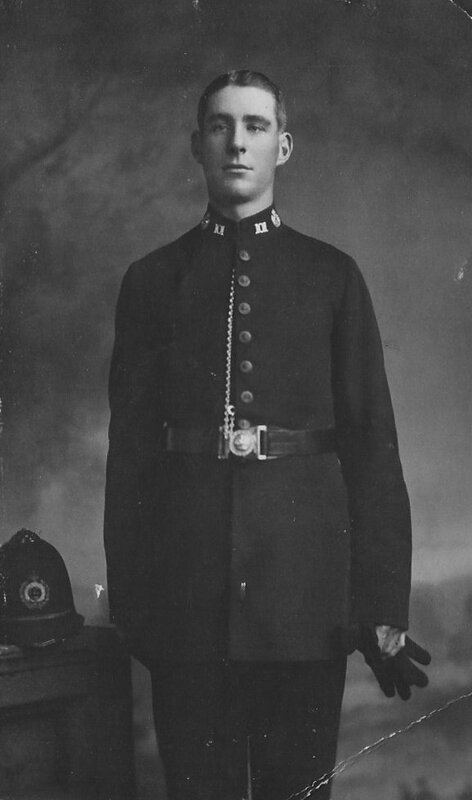 A civilian once more, Charlie nonetheless again opted to wear a uniform joining Berkshire Constabulary. After his basic training he was stationed in January 1912 at Maidenhead as a police constable, and two years later he married Laura Ashley in the town. Laura was born in Cippenham Buckinghamshire in 1892, the daughter of a railway platelayer. At the time of (or shortly before) their wedding she was living in Slough in the house of a schoolmaster at Eton College, as nurse to his young children. In October 1914 Laura gave birth to Dorothy Laura, but by then Charlie was back in khaki in France with the original BEF. He was never to see his daughter. When Charlie was recalled to his regiment at the outbreak of war, 1/Suffolk was still in North Africa but had moved from Alexandria to Khartoum (and was unable to reach France until January 1915). 2/Suffolk was in Ireland at the Curragh but the urgency of mobilisation was such that the battalion arrived in France on 17 August and crossed into Belgium five days later. Charlie was drafted to the 2nd Battalion, and he was recorded as entering the war theatre – now minus his L/Cpl stripe since 2/Suffolk had a full complement of NCOs – on 23 August. That was the day the Retreat from Mons began, as a vastly superior enemy threatened to overwhelm the BEF of 1914 – ‘The Old Contemptibles’ – which was forced to abandon its defensive position on the Mons-Conde canal. There is no record of when Charlie met up with the battalion but it seems certain he had found it by 26 August when 2/Suffolk and the three other battalions of the 14th Brigade fought a desperate rear-guard action – the battle of Le Cateau. By holding up the German advance this action was instrumental in protecting the withdrawal of the two other brigades which composed the 5th Division, but it did so at enormous cost. Casualties in 2/Suffolk ─ killed wounded or missing ─ totalled 720 from a normal battalion complement of about 1,000, but Charlie was not among them. “They [the Suffolks and Argylls] had for nine hours been under an incessant bombardment, which had pitted the whole of the ground with craters, and they had fought to the very last, covering themselves with undying glory” (Edmonds , pp. 164-5). When the survivors were able to regroup on 28 August the 2nd Battalion numbered just 229 (Murphy, pp. 35, 37). For the following ten months of the war there is no information about Charlie other than the general history – the War Diary – of his battalion (National Archives ref. WO 95/1424/1). Initially the remnant of 2/Suffolk was attached to the 1st East Surrey Regiment pending the arrival of replacements for the battalion’s heavy losses. From Le Cateau the Suffolks were forced south, crossing the rivers Aisne at Attichy on 31 August and Marne at Isles-les-Villenoy on 3 September. 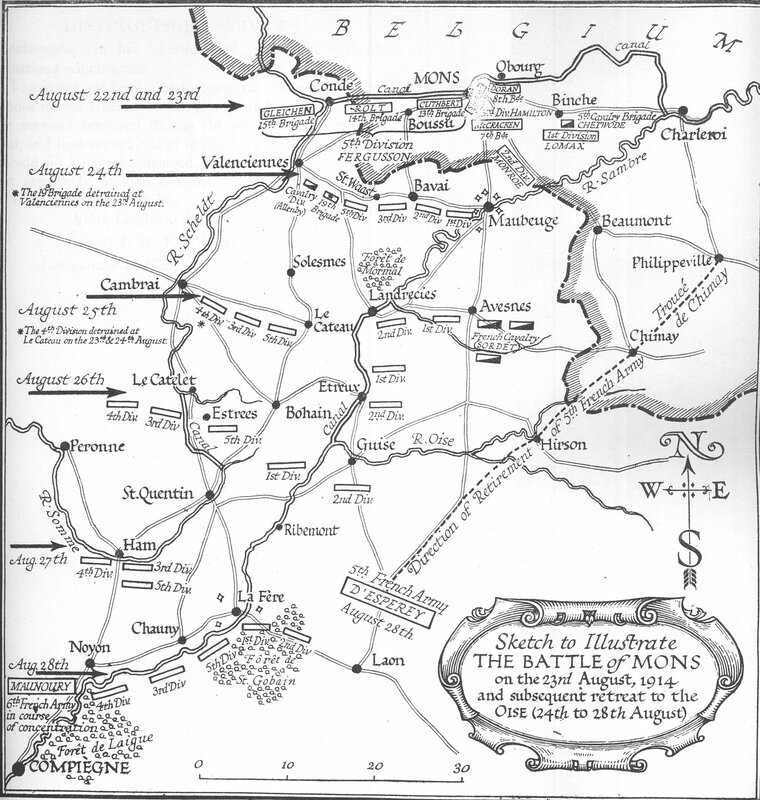 But the Battle of the Marne – the miracle – halted the German advance towards Paris, and the pursuers briefly became the pursued. The battalion recrossed the Marne on 9 September heading north-east, and reached the Aisne at Soissons four days later. But at this point stalemate between the two contending armies dictated that the war of movement should become a war of attrition as both learned the art of digging trenches while under fire. At the end of September 2/Suffolk took over duties at GHQ, moving with it from Fère-en-Tardenois to Abbeville and then St Omer. But this period of respite ended on 25 October when the battalion was moved north to the front in the area of Vieille Chapelle /Estaires/Bailleul. At the end of November the battalion moved again to the Heuvelland district of Flanders (Scherpenberg/Westouter/Loker) where it remained until the end of 1914. Alternating between billets at Westouter and occupying trenches the battalion happened to be in billets over the Christmas period so there was no question of an informal ceasefire in no-man’s-land, nor would it have been mentioned in the battalion’s War Diary had such an event occurred. At the start of January 1915 2/Suffolk took over trenches at Vierstraat from French infantry, alternating with rest at billets at La Clytte (De Klijte), in a pattern of deployment of the battalion which showed little variation until the end of May. The sector was generally quiet in the first months of the year with no serious attacks mounted by either side. But in mid-April British units attempted to retake Hill 60 to the north of Vierstraat. Hill 60 was important as an elevation giving observation over the area of Zillebeke and Ypres, but the attack was resisted by the German army with the aid of the notorious first use of gas in the war. 2/Suffolk was not directly involved in this, the Second Battle of Ypres, but the strategic importance of the Ypres Salient resulted in its redeployment to take over trenches at Hooge, near Zillebeke, on 8 June. On 16 June the battalion was given a support role in a divisional attack on Bellewaarde, and by the time it was withdrawn from Hooge to rest billets at Brandhoek on 20 June it had lost 19 killed and 80 wounded. 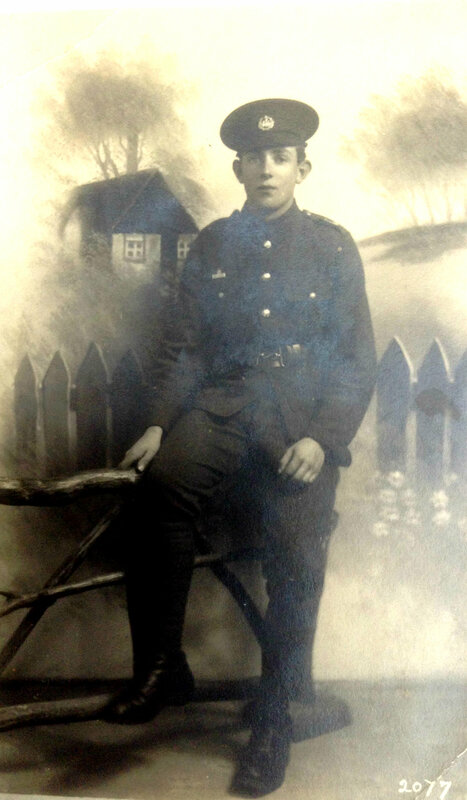 The following day – 21 June 1915 – Charlie Goodchild was admitted to Ward 6 of No. 13 Stationary Hospital at Boulogne-sur-Mer: his right thigh is fractured & he has a wound in the head. He is going on as well as can be expected. This much was communicated to his wife Laura by the indefatigable and invaluable letter-writer Lady May Bradford. As wife of Sir John Rose Bradford, Consulting Physician to the BEF, she found herself in France from October 1914, officially a Voluntary Aid Detachment (VAD) but not in uniform and not obliged to submit her letters to the censor. For the next five years she acted as a letter-writer for the wounded from the British hospitals. None of her four letters to Laura give any indication of where or when Charlie was wounded, but another surviving document indicates that it was at Hooge and therefore on or after 9 June. In her second letter (23 June) LMB reported that he is better today & feels much more cheerful than yesterday. He send his love to you and the baby. At his request LMB enclosed postal orders for £3-15s (£3.75p). But on 27 June LMB’s news was more alarming. I regret to say your husband Pte. C.H. Goodchild is not so well today – he became worse today [? and is seriously ill]. I trust he may improve again soon. I will write again. He told me yesterday that he was anxious to know if you received the £3-15-0 he sent you in a registered letter. He has undergone an operation for his leg today and has not yet quite come round. Among the 25,000 or so letters that LMB wrote to anxious families in Britain there must have been thousands bearing a similar desperately sad message. Yet this is no formal letter of condolence of the kind that Laura received from the hospital chaplain the Rev. SM Wheeler dated 1 and 7 July. There is a sense that he was constrained in what he wrote by his professional duty to write and his Christian faith, whereas LMB as a volunteer expressed her sympathy but also told Laura straightforwardly what had happened. We may hope that Laura found consolation in the chaplain’s words: I am so glad you can submit to God’s will, as I feel sure that some day you will be able to thank God for all that has happened, but I do sympathise most keenly with you in your present great trial. 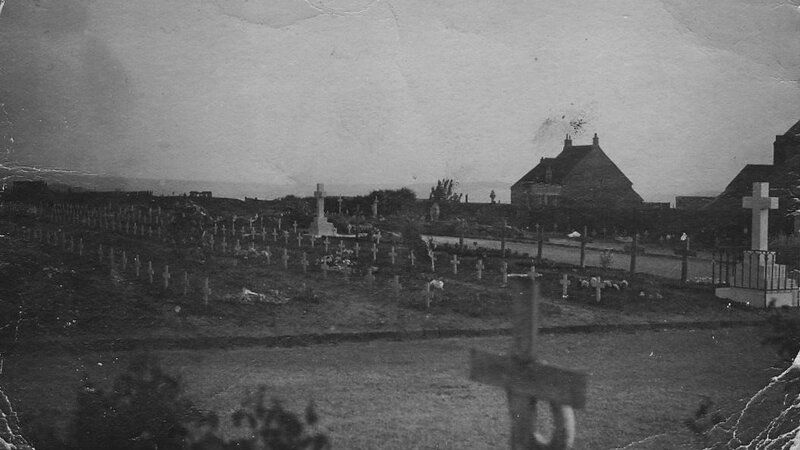 The chaplain also sent an inevitably rather gloomy postcard of the cemetery where Charlie was buried on 1 July in grave no. 2518. It comes as a surprise to learn from LMB’s final letter that Charlie had been Mentioned in Despatches, and it is a remarkable though happy coincidence that the list of names for ‘Gallant and Distinguished Service in the Field’ should have been published in The Times on 23 June – after his admission to hospital where the newspaper would be available and before his death, so he could be informed. The Despatch in question was from French, C-in-C of the BEF, dated 5 April to cover the period since 2 February, and the list of names was dated 31 May. It is frustrating that no citation accompanied a ‘Mention’, and even more remarkable that no mention of Charlie appears in 2/Suffolk’s War Diary to explain how whatever Charlie did could have come to the attention of French’s staff. Whatever he did, it must have been an act of great distinction. The list of names ‘mentioned’ in the BEF as a whole is completely dominated by officers and NCOs. Holmes observes (p.587) that regimental officers resented the preponderance of staff officers in the award of medals and other recognition, but even alongside regimental officers ‘other ranks’ were almost invisible. In that regard the list for 2/Suffolk appears to be exceptional in that there are two other ORs with Charlie in the list of 13 names. Unsurprisingly, almost a quarter of all First World War deaths in the Suffolk Regiment were sustained by the 2nd Battalion. “It has been said ─ with only too much truth ─ that the New Armies never saw the Old Army: its men were dead and disabled before ever Kitchener’s men set foot in France” (Edmonds and Wynne, p. 54). Of Charlie’s three Grundisburgh cousins who volunteered to serve in August-September 1914, only George with 7/Suffolk reached France before Charlie was fatally injured, three weeks later. Along with the letters from the Boulogne hospital preserved by Charlie’s widow is a memorial card, written and decorated by hand. It states that Charlie was killed in action at Hooge on Tuesday 29 June 1915. The message of “Ever Affectionate Remembrance” is accompanied by verses including “Lawless man…”, a modified translation of the Roman poet Juvenal. The card is signed “P. McNamee”, and is the only source we have for identifying Hooge as the location where Charlie was wounded. No doubt the distinction between ‘died of wounds’ and ‘killed in action’ was unimportant to Charlie’s comrades, but clearly word reached them that he had succumbed at Boulogne. Who was P.McNamee? There are errors in the records, but the Graves Registration Report of 1923 is correct: 3/9316 Pte. P. McNamee was killed in action on 30 March 1916 while serving with 2/Suffolk (not 1/Suffolk as stated by CWGC), and is buried at Voormezeele Enclosures 1 and 2 near Ypres. The official publication Soldiers Died in the Great War (1921) gives his date of death as 18 June 1915 (eleven days before Charlie’s! ), and this incorrect date appears also in the Ireland National Roll of Honour and on genealogy websites. Peter McNamee was indeed Irish, born in Kilkenny in about 1887. He emigrated to England and in 1911 was lodging (“general labourer’) at 102 Wherstead Road in Ipswich, where he enlisted in the Suffolk Regiment. He arrived in France on 10 October 1914 – almost two months after the main body of the battalion had been mauled at Le Cateau. The date indicates that McNamee was neither a pre-war regular nor a Kitchener volunteer, but a pre-war Special Reserve part-time soldier from (as his service number indicates) 3/Suffolk. 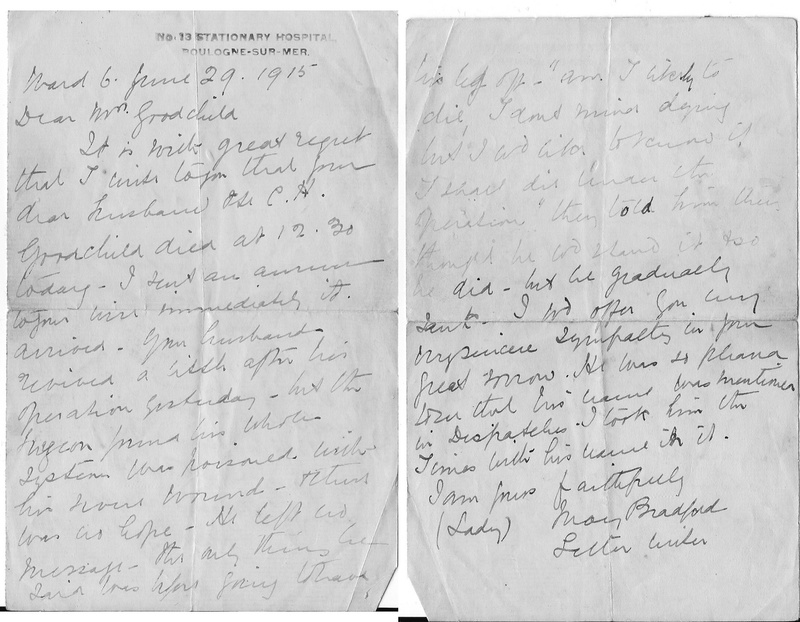 The 2nd Battalion’s War Diary records the arrival of a draft of 94 replacements on 12 October. 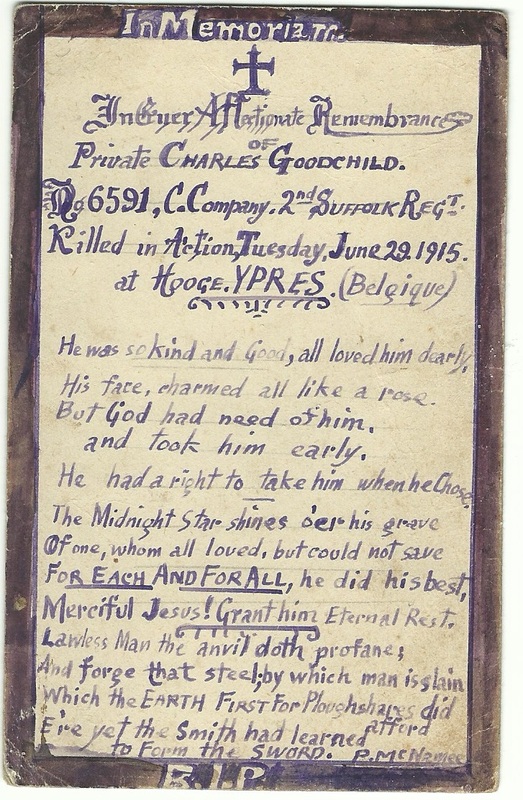 Why did McNamee go to the trouble of preparing the memorial card specifically for Charlie when death and fatal injury were commonplace everyday occurrences in their lives at the front? They had not served together before October 1914, and after 1903 Charlie probably had little to do with Ipswich where McNamee was living. But it seems quite likely that the Irishman had no close family ties and may have been drawn to Charlie in friendship and envy of Charlie’s settled family life and successful civilian career. It may also be that the actions which led to Charlie’s Mention in Despatches won McNamee’s admiration, and might even have contributed to McNamee’s own survival and relative safety. 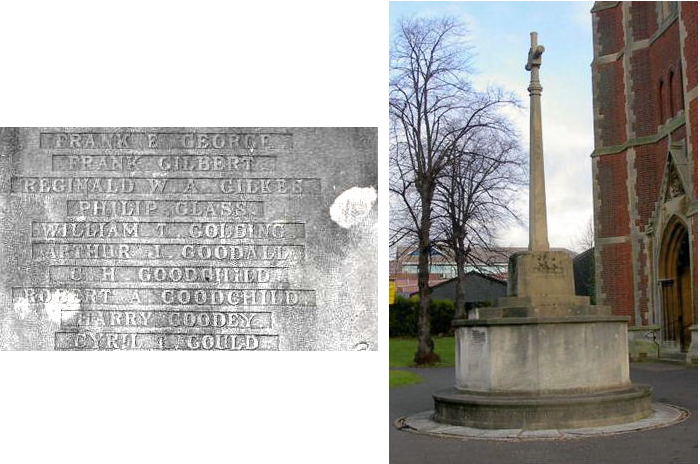 Laura, widowed in 1915, married Alfred Pardey in Lymington Hampshire in 1919, but she ensured that CH Goodchild was inscribed on the Slough War Memorial at St Mary’s Church. Charlie’s name appears also on the memorial of the former Berkshire Constabulary at Sulhamstead (near Reading). By contrast, Charlie was omitted from the seemingly endless but hastily assembled list of Suffolk men (6,600 plus 7 VAD women – no mention of military nurses) serving in all regiments who were killed in the war and commemorated at the Memorial Service at St Mary-le-Tower Church Ipswich on 28 June 1919. Having lost her first husband when he was age 28, Laura lost her second age 34 in 1926. It is ironic that Charlie was given his mother Ellen Goodchild’s surname in the absence of an acknowledged father, whereas although she never met her father Dorothy kept her Goodchild name until her marriage in 1935. Laura Pardey died in 1978 in Winchester, Dorothy Meaden in 1993 in Bournemouth.